UPDATE: Early bird tickets have all been reserved, but general admission seating (as space allows) will begin at 6:30 p.m.
We again are overwhelmed by the excitement people have for this project. We are currently looking at hosting an encore event sometime this fall and will post details when they can be confirmed. The latest of the popular series Pints from the Past on Wednesday, October 12, will feature Laurie Mathews, Director of Preservation Planning and Design at MIG. She will share her work to create a cultural landscape report for the Willamette Falls Legacy Project, which will inform the riverwalk design process. The event will also provide the audience an opportunity to share their thoughts on how to tell the stories of this extraordinary place through the design and interpretation of the riverwalk. Laurie Matthews is an award-winning preservation planner and designer and cultural landscape historian with a diverse range of research, analysis, planning, design and consensus-building experience. She has applied the Secretary of the Interior’s Standards for the Treatment of Historic Properties to dozens of historic properties throughout the U.S., including such iconic places as Yosemite National Park, Hearst Castle, Halprin Open Space Sequence, Dorris Ranch and Point Reyes National Seashore. Ms. Matthews specializes in cultural landscape reports, master plans and interpretive plans for our nation's most treasured places which help shape how we plan, design and understand our heritage. The lecture is being recorded by Willamette Falls Media Center and will be available on the project website (www.rediscoverthefalls.com) 1-2 weeks after the event. 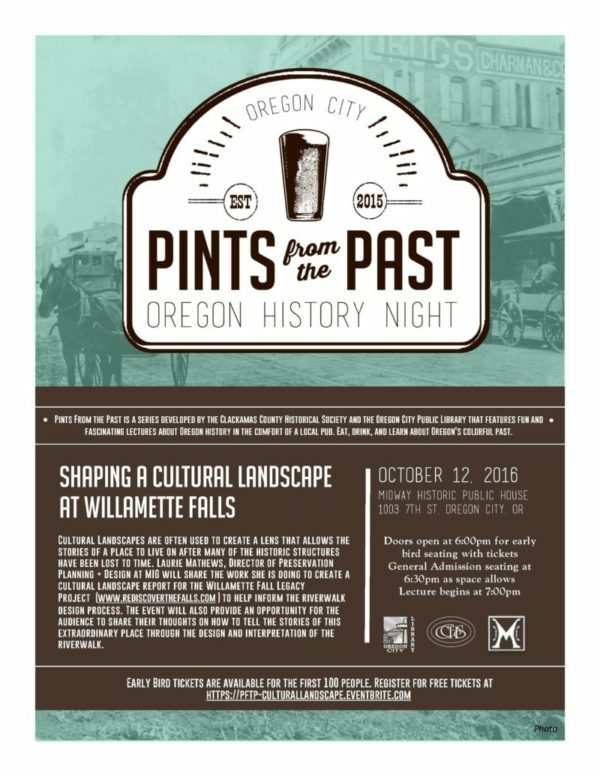 Pints from the Past is a discussion series and ongoing collaboration between the Clackamas County Historical Society and Oregon City Public Library.